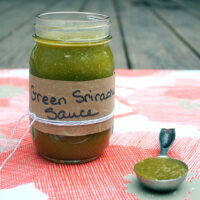 If you haven't tried making your own hot sauce, this green sriracha sauce recipe is a good place to start. It's super simple and comes together in a flash. Blend all of the ingredients until smooth in your blender or food processor. In a small saucepan, bring the mixture to a boil, then reduce to a simmer. Stir constantly for 5-10 minutes, or until the sauce thickens enough that it clings easily to your spoon or spatula instead of running back into the pan. If you want your green sriracha even smoother, you can transfer your sauce back to the blender once it's cool and puree one more time. Store in a glass container with a airtight lid - like a mason jar - in the refrigerator. Your sauce will keep for 1-2 weeks.